Paul Harrison is from St Louis, Missouri. He was raised in a family of musicians and began participating in music at an early age, singing inhis father's church choir. From elementary school through high school, he studied and performed on percussion instruments. He also gained valuable experience performing with his father's music projects as well as playing drum set with his aunt's gospel choir. 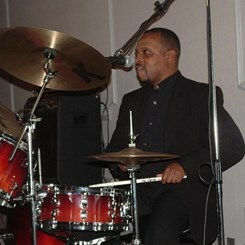 Professionally, he has performed musical styles including classical, gospel, jazz, rhythm and blues, and rock and roll. From the period of 1995 to 2007, he taught adults and children the drum set and other percussion instruments at Youth Arts & Technology Center in St.Louis, Mo. Paul has performed locally, nationally and internationally for over thirty years. Request Lessons with Paul today!